Earlier this week, I posed the question to my blog's Facebook page to find out if my readers would rather see a slow cooker recipe or a Valentine's Day recipe on the blog before the weekend. Man, you all love your slow cooker recipes! One of my brilliant Facebook fans (ahem... Amanda) specifically asked if I could post a slow cooker recipe that would be perfect for a romantic dinner for Valentine's Day! 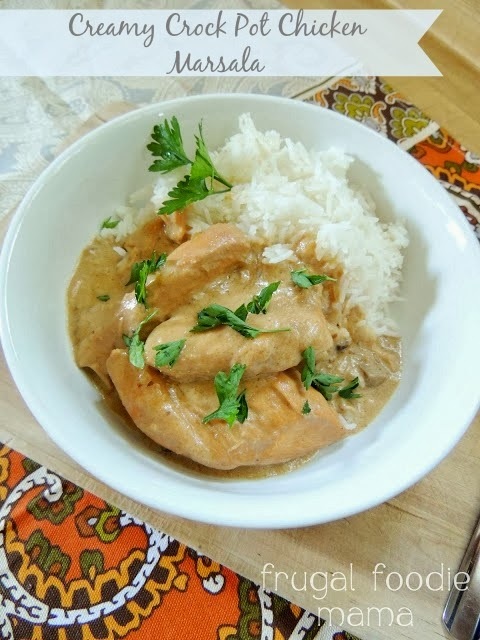 This Creamy Crock Pot Chicken Marsala is a play on an Italian classic that I love- love the dish, just not always the work that goes into making a traditional chicken marsala. This crock pot version is so incredibly easy to get started before leaving the house (maybe 10-15 minutes of prep?). In a small bowl, whisk together the cream of mushroom soup, dry onion soup mix, & Marsala wine. Set aside. Spray the inside of a 6 quart slow cooker with cooking spray. Add in the chicken breasts and mushroom slices. Pour the cream soup mixture over top and mix well. During the last 30 minutes of cooking, add in the butter and half & half. Mix well and cook on Low for the additional 30 minutes. Serve over cooked rice or pasta. Garnish with fresh parsley, if desired. This recipe calls for sliced fresh mushrooms and any other time I would have totally tossed them in there... but I made this as a romantic dinner for my husband and he well... hates mushrooms. Loves the taste of them, loves the flavor they give a dish, but loathes the texture. So, the version I photographed for this post is sans the sliced mushrooms. I know... I am such a sweet wife, right? ;) Feel free to throw in the mushrooms or leave them out. Either way this chicken dish is creamy and phenomenal!